We do not work for insurance companies, we work for YOU! Lakes Area Auto Body is owned and operated by Ricky Besmehn. Rick Besmehn (senior) started the business in 1974 with the mission of providing custom auto body repair services to the Brainerd, MN area at reasonable prices. Son Ricky Besmehn took control in 2015 and melded his propeller repair business in with the auto body service. 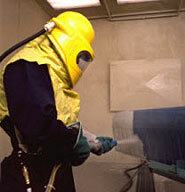 Trailer repair: painting, sandblasting, electrical, and more. Fish house repair – wheelhouses, etc. Boat propeller replacement with new or refurbished props. Lakes Area Auto Body is known for attention to detail, bringing your job “Back to Exact”! We provide a variety of welding services including skeg repair, trailer repair and welding services and painting services for boats, cars, and trailers. We will restore your vehicle, boat, ATV, or trailer to that “just like new” condition you deserve. We work with all insurance carriers and take all major credit cards.